The beautiful, graceful bracelet created and hand-fabricated by Rosario Garcia takes your breath away. Down to every one of its more than 100 elements, this piece delights. Rosario has had a fascinating life that is filled with love, spirituality and a joy in all that is around her. Her positive energy is visible not only in her jewelry but in everything she touches. She is an inspiration on so many levels. 18K gold, Colombian emeralds, Australian opal and diamonds. The piece for which the prize was awarded was created with more than 100 small elements that I created individually, which were then put together to form the piece. My work starts from scratch, preparing my own alloy, making my own sheets of gold and wire, and selecting gems according to the design of the projected piece. As my technique is fabrication, I do not use molds of any kind, but each piece is elaborated by folding and forging the gold. The beauty of nature and its organic forms. I personally believe that being connected to God is an inexhaustible source of creative inspiration. About three months. I had to set the piece aside a couple of times to rethink and readjust the design to make it feasible. That bending hollow structures in a fabrication technique is extremely difficult and challenging, so I will use alternative techniques for the next piece I do. My husband always says that every piece I design already has an owner who will claim it at the appropriate moment. The many small elements that form it. Countless times during the process. I was self-taught in the beginning. I was surrounded by many artistic people while growing up, such as my mother who did painting, sculpting and jewelry. After I began to create my own jewelry designs, I also became associated with other jewelers from whom I picked up various techniques that I added to my repertoire. And I eventually received some training through an art institution known as ACAA (Cuban Association of Artists and Craftsmen). I then received my professional training in Florence, Italy. Traveling around the world in our mission field brings us into contact with many different cultures and communities that enrich our spiritual life and allow me to see and express beauty in a different way. The exuberant beauty of Africa, especially Kenya and its people, is breathtaking; working and living amongst them has changed my life and work as a designer. India also is an amazing country with wonderful people. We had the opportunity while working with orphans in New Delhi to travel to Agra and visit the Taj Mahal, which was an experience that changed my perspective of design. Even though I can’t say my husband, Enrique, has been my mentor, he has played an important role in the development of my career. I have to say that he is the main reason why I’m doing jewelry today. My dear husband is more than a mentor, he’s been my coach. After years of working as a metalsmith in Cuba, I had to work as a waitress in order to keep body and soul together and build my career as a metalsmith when I first immigrated to the United States. (Although I was a terrible waitress and often fired.) 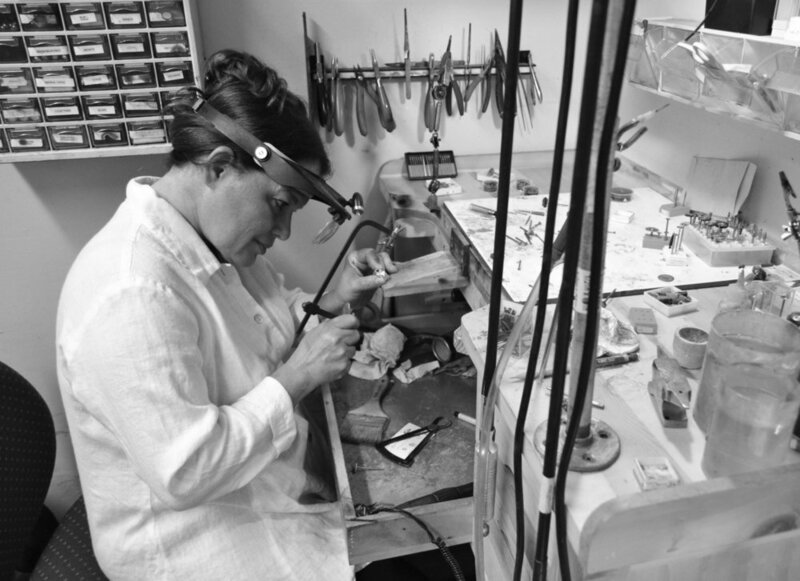 At the present time, I am a full-time goldsmith in my studio. But my husband and I also work with Assembly of God ministries in the missionary field and as volunteer chaplains with the inmates at detention facilities in Broward County, Florida. When I’m traveling, in contact with nature and away from the workshop. Over the centuries, jewelry has been an art form that has connected civilizations, fashion styles and time periods. My goal is to present jewelry as a form of art to future generations. Mainly through advertising in magazines and on social media websites. Primavera: A collection that shows organic forms of leaves and branches. Africana: I named this collection in honor of the African people. It is similar to Primavera but with the use of strong color gemstones. Oriente: A pearl collection. The past six years we have being working with Fiji pearls, one of the most exotic pearls in the world. Just my husband, Enrique, and I. He is the CEO of the company. I am the CAO (Chief Artistic Officer). We have a secretary, Janelys Juvier, in charge of office work and mailings. And a publicist, David Rosenthal. Designing and creating jewelry is my passion. It helps me escape from the natural world and get connected to my Creator. The first piece was a set including a necklace, bracelet and earrings, made with leather, hardened with lacquer, without any metal, as few materials were available in Cuba at that specific time. I love the clarity of its natural lighting. Space. I lost my studio due to a fire last year. I had to relocate to one of the rooms of my home. So we are in the process of building a larger studio. An old rolling mill given to me by my mother and father more than 20 years ago, which I use to roll all my sheet and do wire. I can’t live without it. I used to work on many projects at the same time. Then I was advised to concentrate on one project at a time. Follow the rules of your mentor/teacher, and then, when you have grown up as a designer, break as many of them as you can in order to be creative. While on mission trips in Africa, the intricate craftsmanship of the local artisans in Nakuru, Kenya, always leaves me amazed. I consider them to be magicians, always demonstrating the amazing ability to create masterpieces from practically nothing. I own several pieces of their work, which bring me back to my roots and remind me where I come from. That keeps me pushing forward, appreciating everything that God has done with my career. I am proud of having been able to finish jewelry school in Florence and being able to submit myself under strict training in classical methods. I used to call my instructor a Sergeant. I have always been something of an anarchist and a rule breaker, so finishing the training was not a small achievement for me. And I also was able at that time to meet and learn from great designers, such as Maestro Alessandro Dari. Giovanni Corvaja, in my opinion one of the best contemporary designers of our time and an incredible human being. We exchanged emails in order for me to meet him while in Florence, but he lives in Todi, which is far from the school and time didn’t allow it. When I learned I had won, I was returning home from an event in New York. I broke down in tears in front of a large crowd of strangers at the airport. I felt very humbled to realize I had been chosen to receive the award among such a wide field of talented artists. The decision was not really mine. I did not feel ready for the competition, but my husband decided that it was time and he would not take no for an answer. I have won several awards in my category in various events, but the most important has been the 2015 Niche Award, First Place in the Fine Gold category. I want to thank Rio Grande for the opportunity to participate in this wonderful event, for keeping alive the memory of Saul Bell, and for continuing to encourage jewelry designers around the world to excel in their craft.